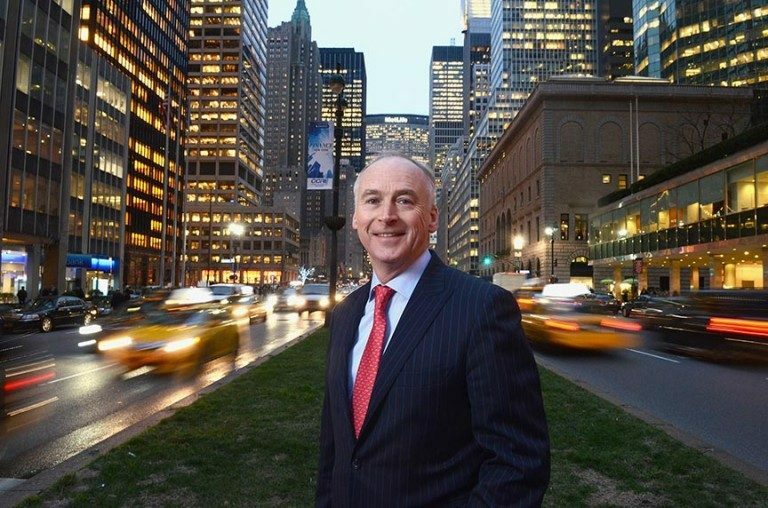 John Fitzpatrick, is a well known hotelier and philanthropist, and owner of the Fitzpatrick Hotel Group New York. He was born in Dublin, and with his father, brothers and sisters worked in many of the Fitzpatrick Hotel Group’s Irish hotels in the 1970’s and 1980’s. He has called New York home since he opened the doors of the Fitzpatrick Manhattan in December 1991. The Fitzpatrick Manhattan hotel, was the only Irish owned and operated hotel in New York. Today, Fitzpatrick Manhattan and it’s sister hotel, Fitzpatrick Grand Central are still the only Irish owned and operated properties in Manhattan. John learnt everything about the hotel business from his father, Paddy Fitzpatrick, who worked in many hotels in Ireland prior to buying the Killiney Castle Hotel in Dublin. He soon added the Fitzpatrick Shamrock Hotel in Bunratty, County Clare, and the Fitzpatrick Silver Springs in Cork. His mother Eithne, a former Miss Ireland, was also hugely influential on his career. She worked with his father on building up the family business and on every aspect the hotels interior design. The second eldest of Paddy and Eithne’s five children, John wanted to get international experiences, and headed to the United States at an early age. He worked in various cities including Las Vegas and Chicago, before he come back to the family business in Ireland. In 1990 he returned to New York to look for a suitable property to renovate and turn into a Fitzpatrick Hotel. To save money he stayed in the empty hotel during construction, padlocking the door after the crews went home at night. The hotel opened its doors in December 1991. The hotel has become hugely popular with heads of state, Irish stars and the Hollywood A-list alike. Due to its success, a couple of years later John opened another New York hotel – The Fitzpatrick Grand Central. Such is John’s reputation in the hospitality industry that he has served terms as chairman of the New York Hotel Association, chairman of the American Hotel and Lodging Association and is currently chairman of The Ireland Funds. When his parents passed away, John decided to commemorate her with an annual golf tournament. To date this event has raised millions of dollars, these funds have been used to support various charities including Corrymeela Centre, County Antrim, Barrettstown, County Wicklow, and Barnardos. All of the funds are distributed via the Paddy & Eithne Memorial Fund.